Law education in Pakistan is below the international standard and we have seen the rise of private college as one of the reasons for over production and low quality of law graduates. The law people including famous lawyers and senior judges have spoken on this topic many times. The PBC had decided last year to act on this issue and 5 year L.L.B. program was made necessary by the council education committee. 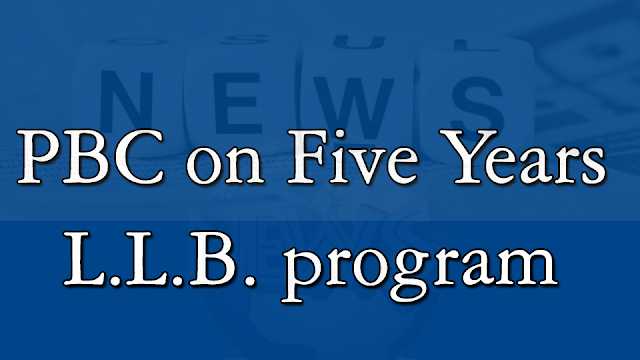 The legal education committee of Pakistan bar council has conveyed to all universities that are providing legal education to ensure the implementation of 5 years L.L.B. program from the academic tear 2016-17. The PBC has changed the rules for the betterment and quality of law education. Pakistan bar council has also cleared that if any university failed to implement these new regulations, its registration will be cancelled by the bar. Now! According to rules, all the legal education imparting institutes are required to start 5 years LLB program and 3 years of programs have been finished. In “Pakistan Bar Council Legal Education Rules, 2015”, The Pakistan bar council has made the 5 years program compulsory from 2016-17. The committee hoped that institutes will start implementing new rules in full letter and spirit and the coming admissions will be offered under such conditions. The secretary of Pakistan bar council, Arshad Mehmood said that students whoo want to get admission in law programs must know that they have to get enrolled in five years L.L.B program, in case, they opted for other option, they could not be registered with the council and eventually they will not have the permission to start practice as advocate. These kinds of act will made further problems instead of any betterment. The need is to upgrade the coursework and induce new state of art practice in contrast with modern law practices. The private law colleges have given the free hand to work without the proper check on faculty and infrastructure of institutions. The universities are offering different law related programs without taking account the required PHD faculty and state of the art examination system. The government should make the law education monitoring, a federal responsibility and a special wing of HEC should be designated for law institutions re - registration under new criteria and for the monitoring of law education. The Pakistan bar council, if truly wants to change the law scenario, and then its first priority should be the identification of fake lawyers in our judicial system. It is been reported many times that in bar council several fake lawyers on fake degrees have been given permission of practice just on political grounds.